Once upon a time in Planet Fashion there were three kingdoms. Haute-Couture was a mythical, magical place where pieces took months to make and were destined to be worn by the minted and gifted (that would be billionaires and Hollywood A-Listers during Awards Season). Pret-A-Porter an almost equally fantastical place was where beautiful clothes were still the order of the day, although retail and shops were in mind rather than customers who had never flown commercial, hence a shorter turnaround time in the presenting and making and greater profits for designers. And then there was Diffusion; call her the spunkier younger sister of Pret-a-Porter, obviously related, but with a different point of view: pieces were often edgier, fabrics maybe not quite as luxe and because of this clothes were a great deal cheaper. Of course there was another kingdom, sprawling in size and bigger than everything else put together called High-Street, but that’s a story for another day. But returning to our siblings Pret-a-Porter and Diffusion; things have been what can one say, complicated in terms of growth, development and market share. It used to be simple go to any department store in the world and the sister’s domains were clear cut for a shopper: one floor would be full of Pret-a-Porter, Dolce and Gabanna, Marc Jacobs, Donna Karan, Prada and so on and the next floor would be full of diffusion: D&G, Marc by Marc Jacobs, DKNY and Miu Miu. But consumer habits (happy to shop in the High Street Kingdom for most things, save/max the credit card for key pieces in Pret-a-Porter and remortgage their home/pray they bagged a billionaire for Haute Couture) meant some of these Diffusion brands have shuttered, and in the aforementioned list only Miu Miu has successfully transitioned from younger sister to player in her own right as its quirky aesthetic was refined to something every bit as covetable as Prada’s. However, observe the African markets and things are a little different. The love and devotion to looking fantastic is every bit as intense (in fact I would argue sometimes more so), as in other parts of the world, but the way that the industry has developed means there is space and in fact a desperate need for diffusion lines. It begins with the absurdity that ALMOST everyone, and this is no exaggeration, perceives and describes themselves as ‘Couture’ never mind that hems remain unfinished, construction hit and miss, petit-main precision is nowhere to be seen and the fabrics are itchy-scratchy synthetic rather than the finest silks, wools or cottons. This is not to say that there are no lines producing haute-couture in Lagos or elsewhere in Africa, but the waters are muddied by there being no clear demarcations and the term being used with no real understanding of what it takes to produce like that. A Second reason for a need for diffusion is due to the current locus that the most of the celebrated designers in Africa are operating in, the Pret-a-Porter Demi-Couture space, being where production costs and attendant challenges gobble up margins most. 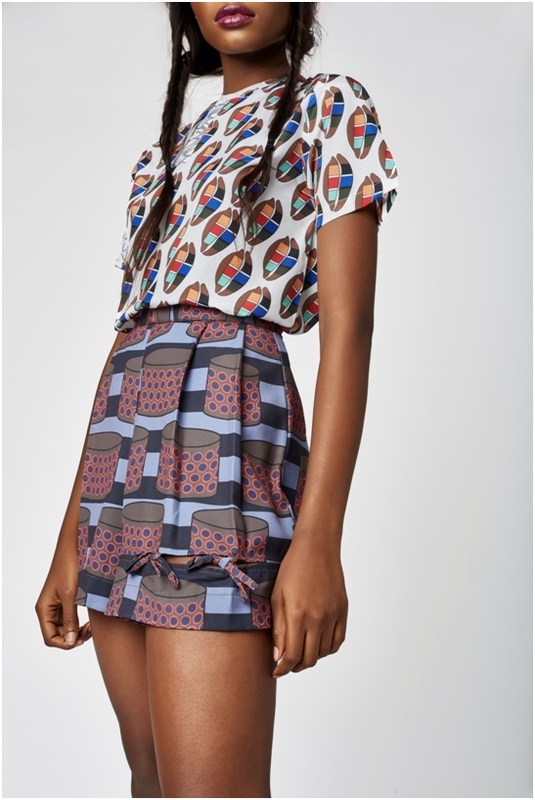 While some fashionistas in Lagos eye roll and hiss at the cost of a Bridget Awosika, Orange Culture or Lisa Folawiyo Studio piece, it is quite simply not easy to produce and retail here in Nigeria, and we would all be kind to remember that these are businesses and luxury brands not our tailor that we all have on speed-dial to whip something up sharpish. 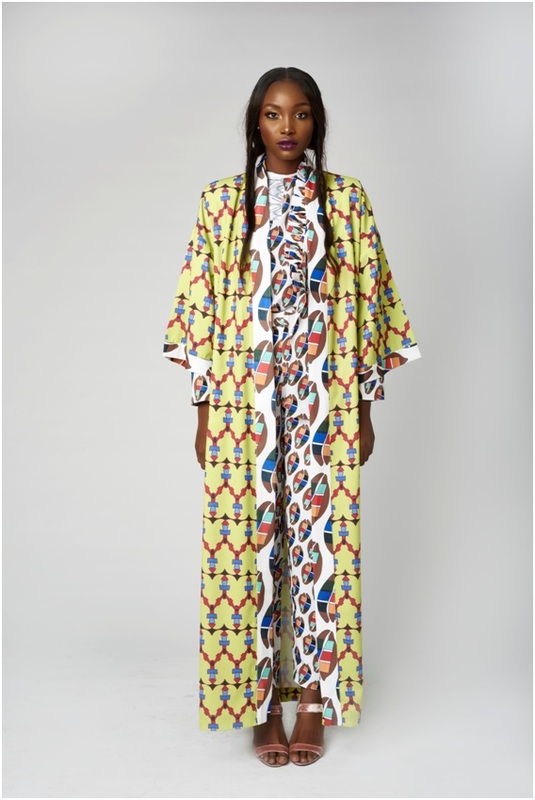 Stepping up to the challenge of developing a sibling brand to feed insatiable fashion needs here is Lisa Folawiyo, who launched her diffusion line J Label to critical acclaim at Temple Muse last month: “there was a growing need for us to fill an increasingly widening gap in the Nigerian fashion market…a need for stylish well designed, beautifully finished with a luxurious appeal but most importantly affordable clothing.” Says Folawiyo, who pioneered embellished Ankara with her Jewel By Lisa line and cemented her dominance with an international celebrity-heavy client list and LF Studio a line that expands on her mastery of juxtaposing print and proportions. Known for her own love of international designers (her IG feed is an intoxicating mix of her rocking the hottest looks from the runway, Balenciaga and Vetements being firm wardrobe favourites as well as accessories that will cheer the heart of any fashion enthusiast), she was keen for her brand in particular to be more inclusive and not just for the privileged few. 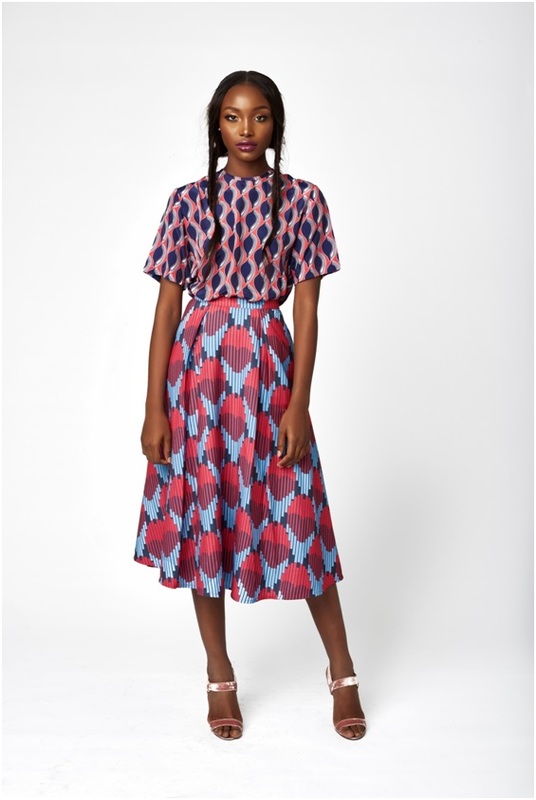 With J Label, Folawiyo has cleverly not fallen into the trap of diffusion breeding dilution. There is a continuum of her brand DNA but without too much compromise: “our unmistakable brand identity is still there, you will still see the mixing and matching of prints, impeccable cuts and clever detailing but because it is a more affordable line there is little or no use of hand embellishment.” The result are pieces that are undeniably Folawiyo designed; one pleated asymmetric skirt and blouse ensemble that combined a navy, coral and dove colured print with a more subdued white and dove counterpoint is a runaway hit in the making with its multi-purpose possibilities. One could wear it on a date, for cocktails with the girls and even church followed by a meet the parents easily. Also flying off the rails on launch night was a lemon yellow, brick red and sky blue maxi jacket: the options of how to rock this particular piece were numerous too: it could used as an up the ante pop of colour accompaniment to jeans and t-shirt, the final flourish to a print-maximalism outfit with a contrasting trouser and blouse combo as styled in the J Label look book ,or if you are planning for a fashion editorial spread worthy summer holiday, as the ultimate bikini cover up as you take in the rays on your super-yacht. The collection didn’t have a name: a clever approach as it allows the wearer to make it their own without worrying whether or not they are channeling the designer’s inspiration: “The J Label girl is youthful, whether young or older, she is super cool, spirited, curious, she’s confident and bold, and a lover of self and life, but above all, she wants to look and feel good at all times. “ In setting the parameters of engagement wider Folawiyo has sidestepped the ‘mutton dressed as lamb’ debate, which has often dogged diffusion lines. J Label is neither for the under 35s only or for only the pin thin. Yes, some of the dresses are super short, but nothing a spin class and mindful eating cannot remedy; what the wearer must have is confidence, vivacity and a joie-de-vivre that is every bit as smile inducing as the prints. 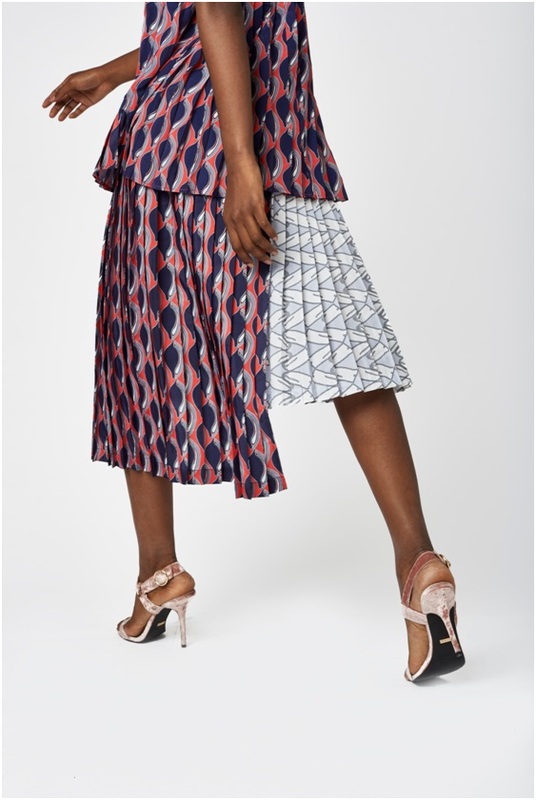 Reassuringly this is not a mad-dash-to-the-border for sales and further recognition on Folawiyo’s part and J Label is part of an integrated expansion and development plan for her brand: “We released a very small J Label collection in 2013. This was to test the waters and although the market was ready we were not. A few years later with improved capacity longer preparation time and greater insight we released this collection. For us J Label is here to stay, we see it as not just offering clothes but having an integral role to play in developing the field of play of fashion in Nigeria. For ten years, clients have come to know and come to us for luxury, and I am still the creative director of a luxury brand, but as a company we are also interested in accessible fashion, of more people being able to experience and enjoy the brand, wear the pieces, live their lives in our clothes and make happy memories in them.” In response to the global trend of luxury brands closing their diffusion offerings and focusing on collaborations with the high-street or indeed the risk of launching at this time Folawiyo remains sanguine: “We have chosen to do what is best for us at this point in time, as those brands chose to what was best for them. Do them closing their diffusion lines ultimately mean we have taken a risk, I don’t know. However, one thing I know is that success will not be achieved without taking risks. The fashion industry is fickle, yes I said it, it is. And nothing is certain. But we do know is that this step is necessary and very important for our brand right now.” And very important for all of us fashion lovers here in Lagos and with prices starting at an entirely doable N19,500 and ending at a reasonable N65,000, no need to expect the bailiffs at the door due to a key items spend=out. Whilst diffusion lines might be fading to black in other parts of the world they remain an important new ingredient in the contemporary African fashion landscape. Between a growing burgeoning middle class that is ready to spend and fluctuating foreign exchange rates rendering many of the frequent travelers grounded rather than off to Europe and the Americas to go wild in the aisles, sibling brands that are as directional as the main line’s offering are essential. Add to this a fashion manufacturing industry that continues to increase in capacity and digital platforms that allow for clothes from anywhere in the world to land on one’s doorstep and the probability of J Label and other African diffusion lines being rocked in other global fashion capitals becomes an inevitable reality. Lisa Folawiyo, Jewel by Lisa and now the J Label… All a dream. Amazing creativity, craftmanship, fabric quality, style and comfort. A brand that is always in my top picks across the entire globe. This is a wonderful approach by LF Studios. It will make fashion alot more accessible and if successful, it will prompt fashion brands at her level to follow suit. One of my major concern about fashion in Nigeria is almost every designer use the term haute couture without having a full understanding of what it is. Your new collection in the July is of great interest to us. We would like to know more about the products your firm offers and would appreciate receiving your wholesale price list and information regarding terms and ordering policy. It is our desire to offer our customers the widest selection possible of custom outfits and sell it here in Australia. Since we are always interested in new products that fall within that area, we request if you be able to send us information.